I have partnered with Raymour & Flanigan, who provided product for this project in exchange for this post. All opinions expressed are 100% my own. This post contains affiliate links. Hello friends! I have been so excited to share this post with you!!! This summer I had the opportunity to work on another Habitat For Humanity project, and it was such a joy to be able to help a wonderful and deserving family turn their new house into a home! 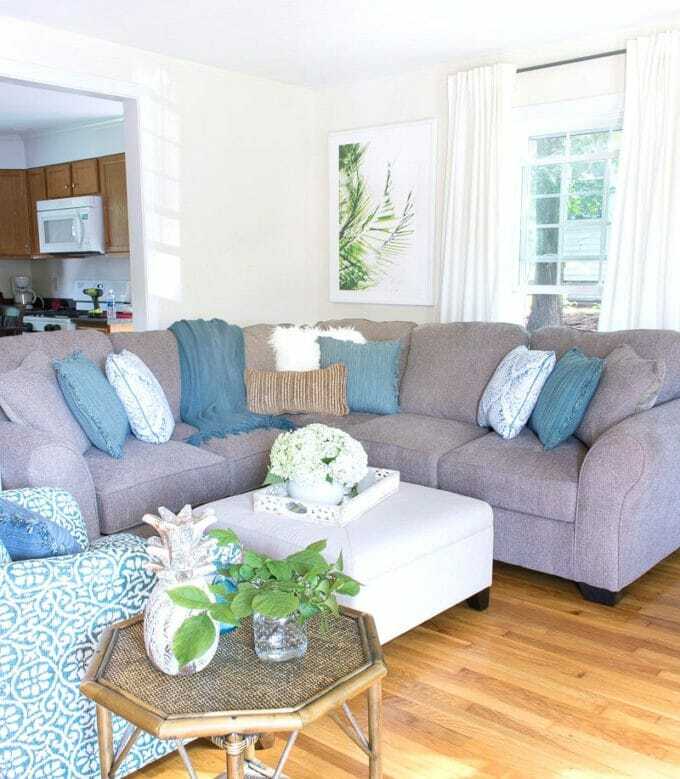 A couple years ago Charlotte of At Charlotte’s House created the volunteer group Bloggers Heart Habitat to partner the skills of home and DIY bloggers with local companies and furnish rooms for new Habitat For Humanity homeowners. 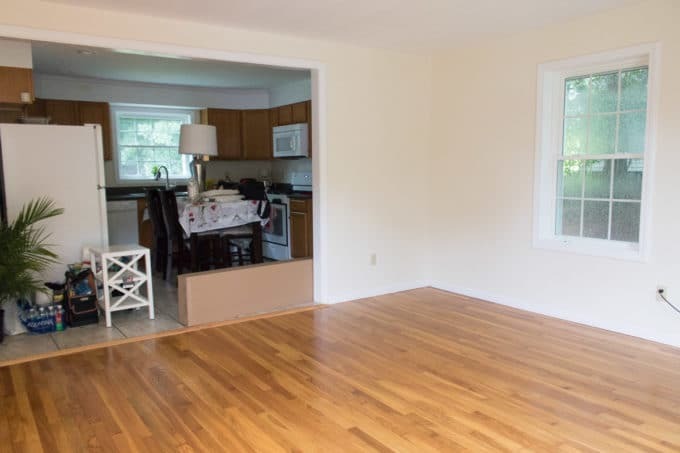 For this house we were charged with outfitting the living room and a boys’ bedroom for a mom and her two sons who recently moved to this home via Habitat For Humanity of Eastern Connecticut. Incredibly, Raymour & Flanigan offered to sponsor this project and provided BOTH rooms with furniture! I teamed up with one of my blogging besties, Kris of Driven By Decor, along our teenage daughters, to design and install the living room, while the amazing trio of Charlotte, Diane of The Rath Project and Carli of Fearfully & Wonderfully Made created the cutest bedroom ever for two brothers. The new homeowner shared her vision for the spaces and it was our job to make that dream come to life. In addition to Raymour & Flanigan, Minted was kind enough to provide framed art for the two rooms and it was such fun to choose pieces that brought these spaces to life. 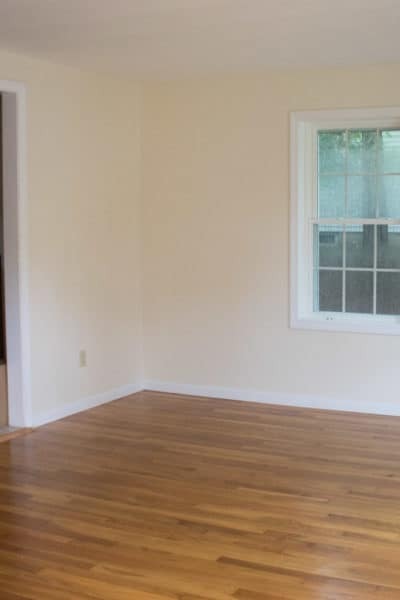 This is the living room space we were working with, a blank canvas with beautiful hardwood floors. 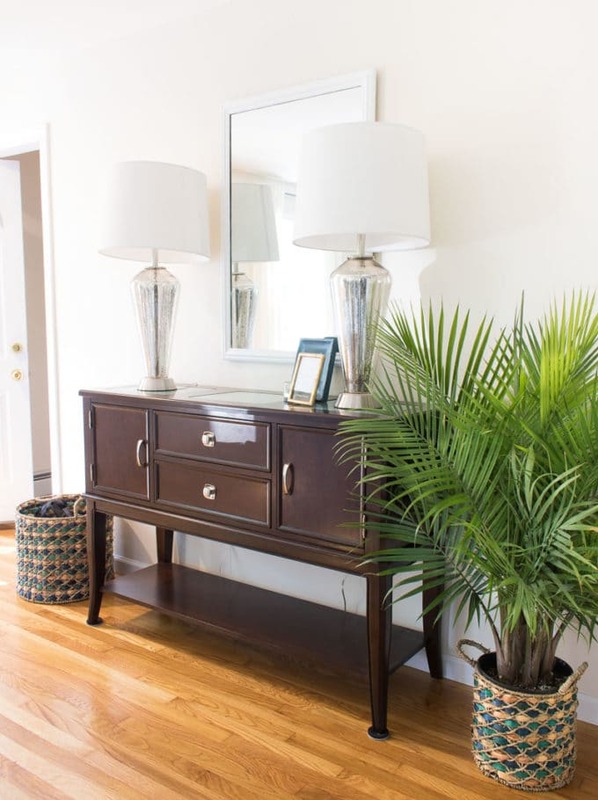 As you walk into the room, to the left was the homeowner’s console table. We added a mirror and oversized mercury glass lamps to throw the light around and give a bit of sophistication to the space, as well as provide a great dropping zone for keys, and a basket for shoes. 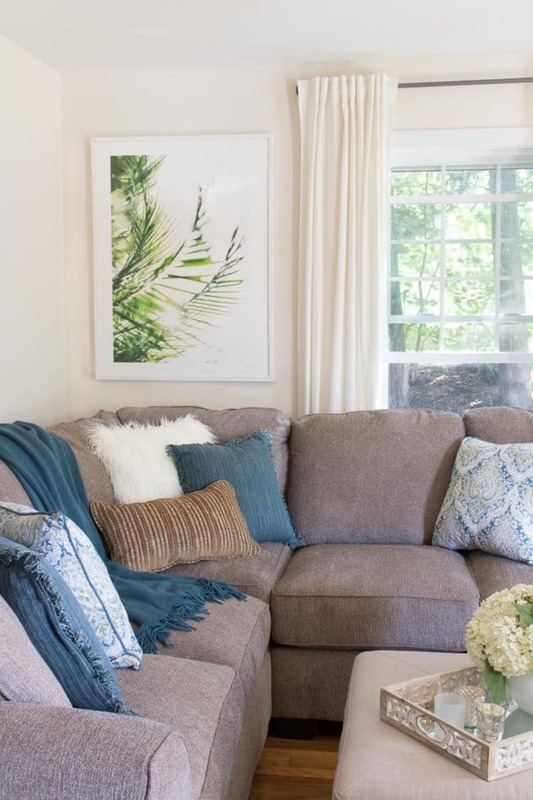 The homeowner’s one wish was for a sectional in this corner if possible, to maximize seating and make the most of snuggle time with her little boys. Kris and I absolutely LOVED teaming up with Raymour & Flanigan to make that wish come true!!! 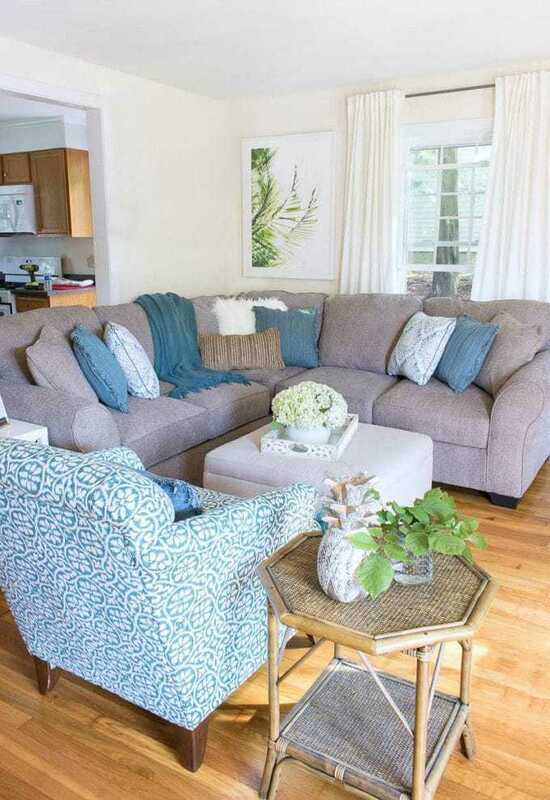 We found a smaller scaled sectional that worked well in this room and comes in a durable, neutral chenille fabric. Super soft, comfy and *scrubbable* :), it couldn’t be more perfect for a home with small kiddos! Let’s talk about the palm prints!!!! I’m obsessed! 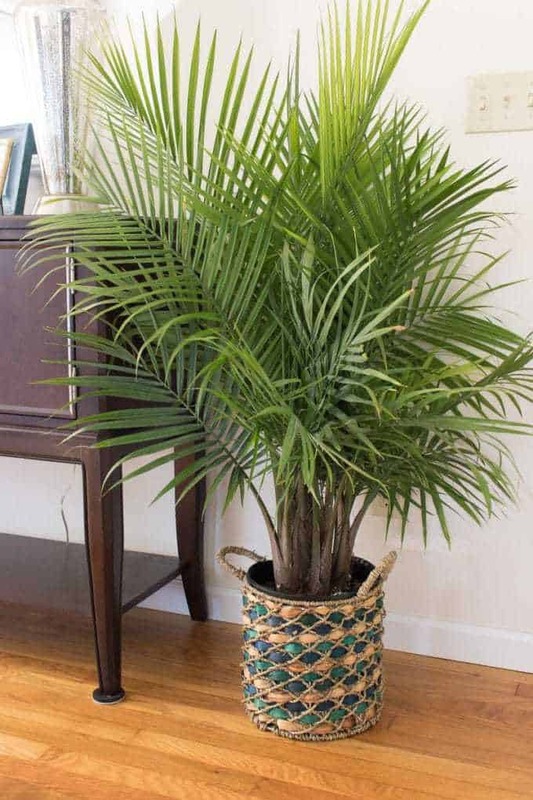 Our lovely homeowner likes a tropical vibe, and I’m totally with her!! 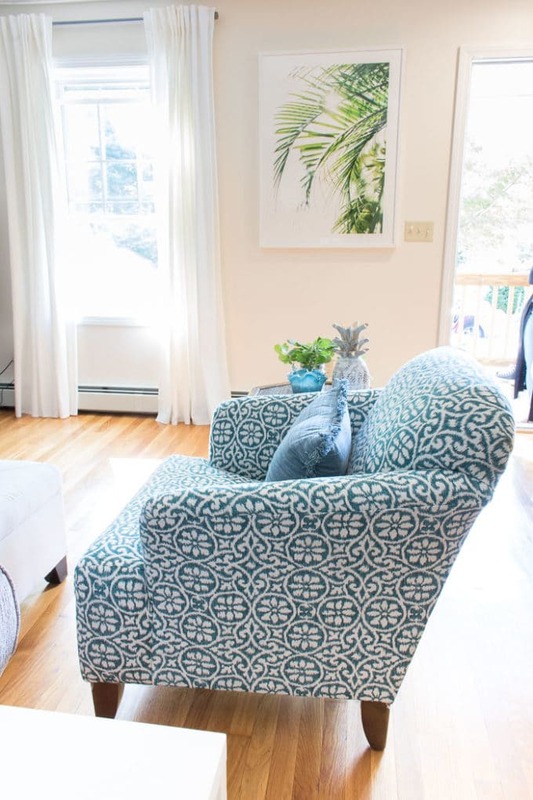 Nothing like two huge, swaying, sunny palm tree prints to help you chill out, right? 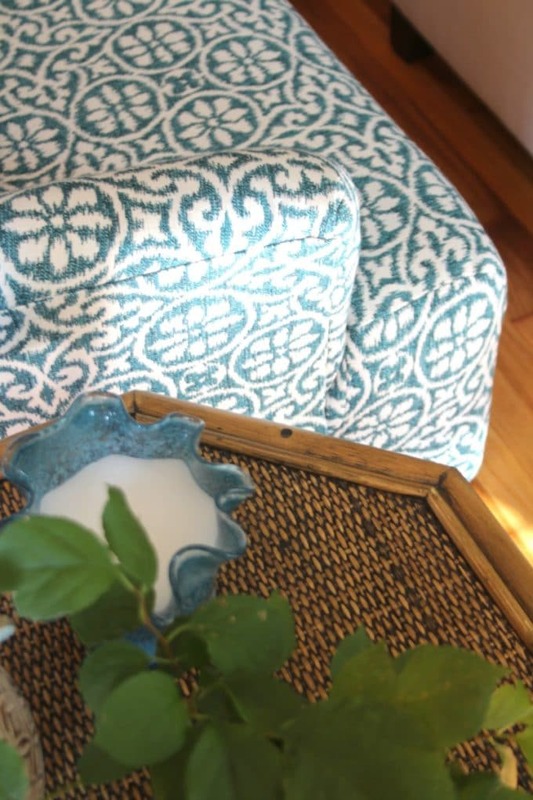 The teal patterned chair is covered in a Sunbrella fabric that will also stand up to spills, stains and sunshine. 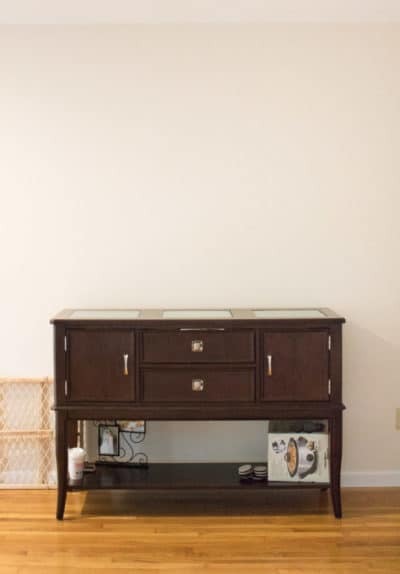 The coffee table is a storage ottoman, and what mom doesn’t love hidden storage for books and toys?? 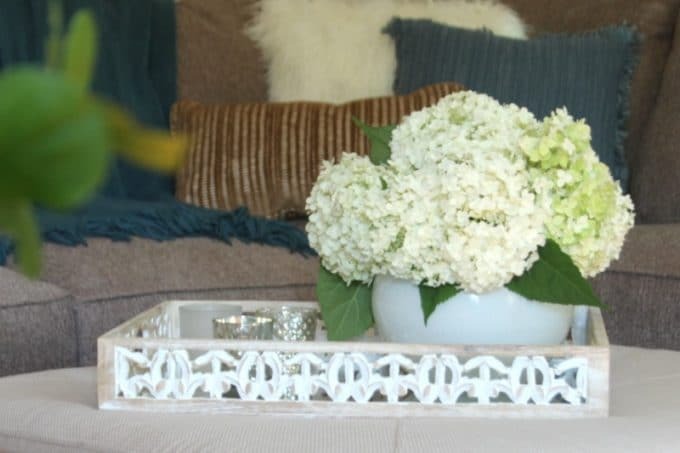 Kris brought some of her gorgeous white hydrangeas for the ottoman tray; this is also the perfect spot for the tv remote or a cup of coffee. 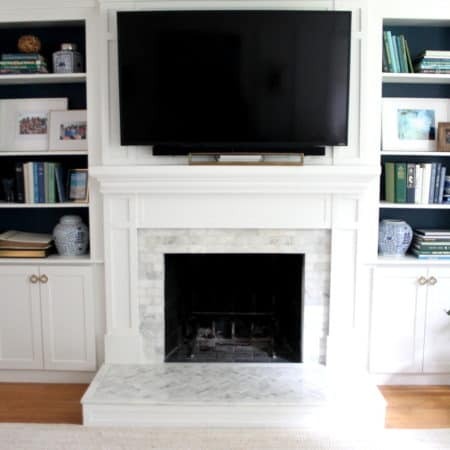 After a long, hot August installation day, the family returned home to their newly furnished living room and boys’ room; I can’t even begin to tell you how wonderful it was to be there for that moment! 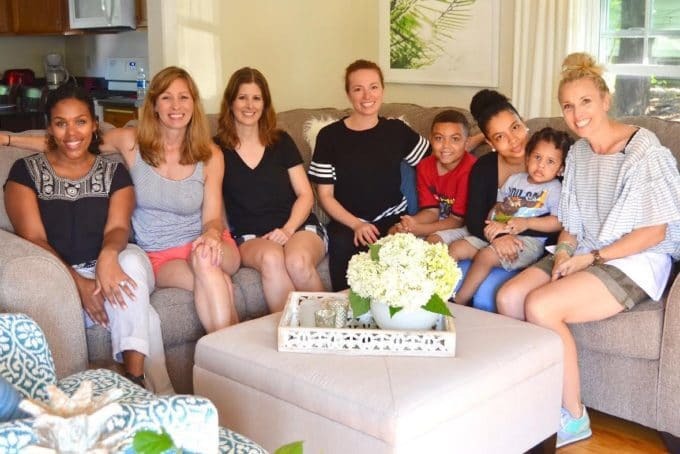 Left to right: Carli of Fearfully & Wonderfully Made, yours truly, Kris of Driven By Decor, Diane of The Rath Project, the homeowner and her boys, and our fearless leader, Charlotte of At Charlotte’s House. To this beautiful family – may your life here be filled with love, laughter and so much happiness!! and many thanks to Minted for the beautiful art that pulled together the spaces! Photo creds for all the good photos in this post to my partner in crime Kris (all the terrible shots are provided by me 🙂 ). It was so much fun to design this space with Kris, and install it with our daughters!! 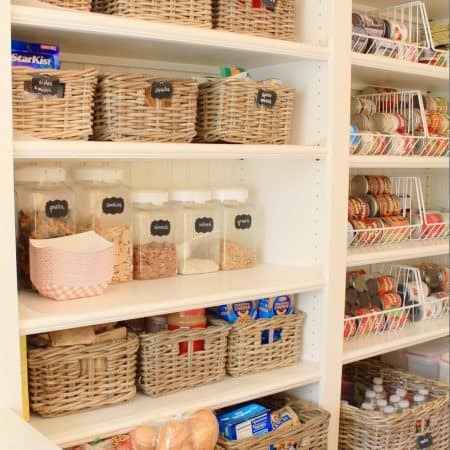 You will not believe how amazing the boys’ room came out!!! 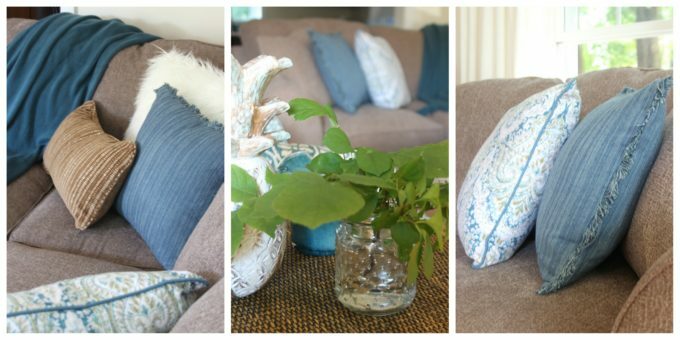 Blue throw blanket, paisley pillows, ottoman tray, mercury glass lamps, glue and gold tabletop frames – all Homegoods finds! Thank you for stopping by to check out this very special design project. Hope you have a great weekend! What a gorgeous room you all created for this sweet family. 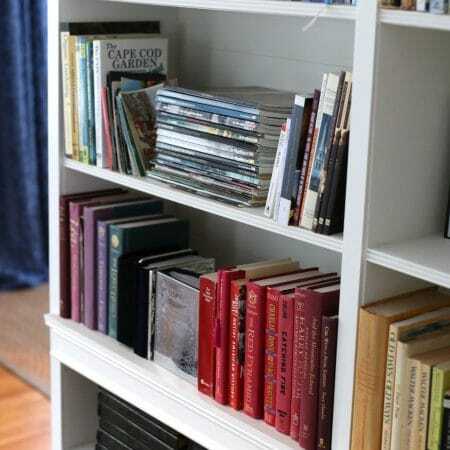 Love the soothing color palette. 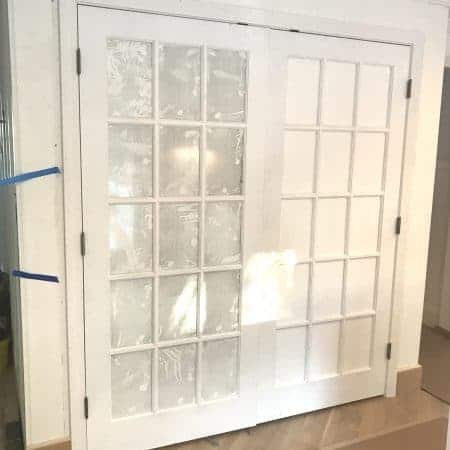 Lauren it was such a wonderful project to work on and fun to try to create the vibe the homeowner was after! you ladies did a beautiful job! love the colors and the palm prints! Thanks Cassie! It was so much fun to work on this project! Amazing job, Lisa!! I’m a big fan of Habitat, what an amazing program it is, helping people get into their dream home! Thanks Debbie! I’m with you, it’s such a great organization and I’m so happy I can bring something to the party and help make a house a home, it was wonderful! Hope you are doing great! This looks so happy and fresh! Awesome job. Warms my heart. Thanks so much Mary Ann! It was such fun working on something like this with other bloggers and the family was SO cute and grateful! You ladies did a wonderful job for a well deserved family. It is beautiful! Maria thanks so much! It was tons of fun and also such a joy to see the family’s reaction at the reveal! How wonderful – and you ladies did a beautiful job! Thanks so much Shelley – it was tons of fun to work with the other bloggers and just the best to see the family walk in the door at the end of the day! So much fun Charlotte!! Can’t wait to do another one!! You ladies did a beautiful job! What a lucky family to have you fabulous ladies design a room for them! Aww you’re so kind! It was our honor to be able to work on this special project. The family is so sweet!